A police officer from the East Pittsburgh Police Department shot and killed Antwon Rose, a 17-year-old Woodland Hills High School student, the night of Tuesday, June 19. Rose was unarmed at the time he was shot. A video of the incident posted on Facebook shows two East Pittsburgh police cars approaching a silver Chevrolet Cruze for a traffic stop. One officer fired three shots at Rose as he fled the vehicle while another individual fled the car. Police took the driver into custody. The two responding officers stopped the car because it matched the description of a vehicle involved in an earlier shooting in North Braddock that left a 22-year-old man wounded in the abdomen. The injured 22-year-old was treated at a trauma center and released. Allegheny County Police Department said they found two firearms inside the silver Chevorlet Cruze after the deadly incident, but Rose was unarmed when he was shot. The Pittsburgh Post-Gazette reported that District Attorney of Allegheny County Stephen Zappala said Rose had an empty handgun clip in his pocket when he was killed. Rose was taken to UPMC McKeesport hospital following the shooting where he was pronounced dead at 9:19 p.m. according to the Allegheny County Medical Examiner’s Office. The 20-year-old driver of the vehicle was a jitney driver who was taken in by police the night of the incident and later released without charges. The second passenger, Zaijuan Hester, 17, was reportedly brought in by police Tuesday and will be charged in connection to the North Braddock drive-by shooting that occurred earlier that night. The Pittsburgh Post-Gazette reported East Pittsburgh Mayor Louis Payne said the officer who shot Rose was hired mid-May and formally sworn in just hours before the shooting on Tuesday. The Allegheny County Police Department issued a statement Thursday confirming Michael Rosfeld was the officer who was involved in the incident. Rosfeld was previously a Pitt police officer and has more than six years of police experience. A rumor circulated briefly on Thursday that police were reviewing a video reportedly showing Antwon Rose firing a gun during a drive-by shooting in North Braddock that occurred minutes before his death. Allegheny County Communications Director Amie Downs issued a statement Thursday afternoon denying that rumor. Both WPXI and KDKA initially reported the rumor, and as of publication time Tuesday night, both news outlets still had the video of the false report available online. The community responded to last Tuesday’s shooting quickly, organizing a protest outside of the East Pittsburgh police station on Wednesday night. Hundreds joined the impromptu rally blocking traffic while rain poured down. Protests continued throughout the week, with demonstrations expected to continue throughout the summer. Most of the demonstrations have been in Pittsburgh, where Pittsburgh Police — not East Pittsburgh Police — have authority. 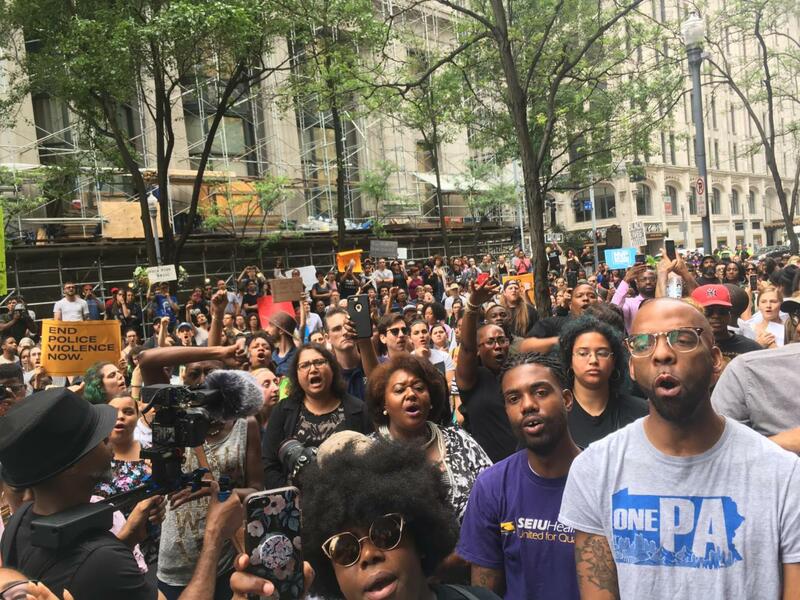 Pittsburgh Public Safety issued a statement on the protests Monday, June 25, which reaffirmed the City’s position. Many high-profile activists attended the protests, including Leon Ford Jr., who was paralyzed after being shot by police six years ago, and Summer Lee, Democratic state House candidate for the 34th District of Pennsylvania. Protesters directed their focus against Allegheny County District Attorney Stephen Zappala Jr., who is up for reelection in 2019. Once Allegheny County identified Rosfeld, the officer who shot Rose, protesters also demanded he be fired and taken to trial — and Peduto agreed on Monday, urging charges against Rosfeld. Rose was a senior at Woodland Hills High School and was expected to graduate at the end of this school year. He was an honor student, previously working at the Pittsburgh Gymnastics club mentoring children after school and as a volunteer for Free Store, a program that gives away surplus clothes and items to those in need. His funeral was held Monday, June 25, at Woodland Hills High School.